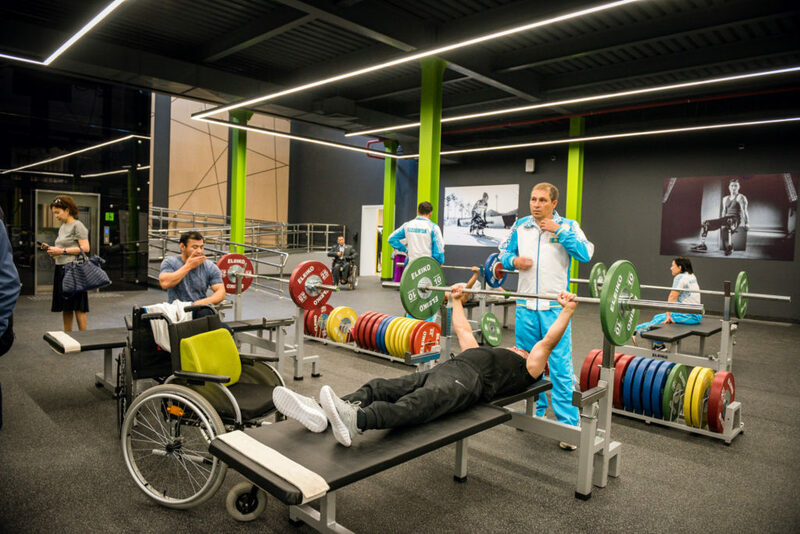 ASTANA – The capital’s Paralympic Training Centre began allowing Jan. 1 free access to its facilities for people with disabilities, reports the city akimat (administration) press service. Paralympic Training Centre. Photo credit: Astana Akimat. The Paralympic Training Centre opened in July as part of the Tugan Zher (Motherland) state programme and is located at 2 Akshoky Lane in the Karaotkel Microdistrict. “The official opening of the centre was attended by Kazakh President Nursultan Nazarbayev and International Paralympic Committee representatives. We were tasked by the President to begin working not only with Paralympians, but also with people with all kinds of disabilities in the city,” said Paralympic Training Centre Director Assan Turlybayev on the initiative. Furnished with special sports equipment meeting international standards, the centre is adapted to people with varying degrees of ability. The building entrance is indicative of this, featuring ramps, tactile paving, automatic door openers and audio greetings in Kazakh, Russian and English. The facility includes Kazakhstan’s first wheelchair washer with tire inflators. It was designed by Kazakh wheelchair dancer Ardak Atarbayev. “All sports equipment is certified so that we can not only hold training sessions, but also host competitions at the level of world championships with this equipment,” he said, adding that approximately 780 people may use the centre’s facilities at once. In addition to working out at the gym, visitors may take part in boccia, chess, golf, table tennis, sitting volleyball, para judo, para powerlifting, para taekwondo, wheelchair dance and various national sports. Instructors also organise individual training programmes, conduct individual and group classes and advise on nutrition. “We do not launch people into the training halls at once, rather complying with certain steps. First, our sports doctor determines your state of health and medical history. Then, you are required to get a doctor’s permit. Only after that do we grant passes, which may be used at any time between 9 a.m. and 9 p.m., all for free,” he said. People with disabilities will also be able to train at Astana’s Tarlan ice arena free of charge after July 1. Following its refurbishment, visitors may play hockey and ice skate at 5/1 Turan Avenue.